Lock in a great price for Sheraton Mendoza Hotel – rated 8.7 by recent guests! The staff are amazing. Hotel is very clean and comfortable and it has a pool! 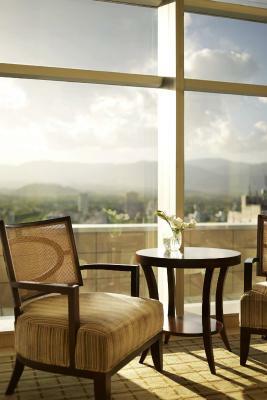 Impressive, seventeen floor concrete tower with a huge lobby and good views from all rooms. Good location on a quiet street at the edge of busy downtown area with restaurants and coffee shops. 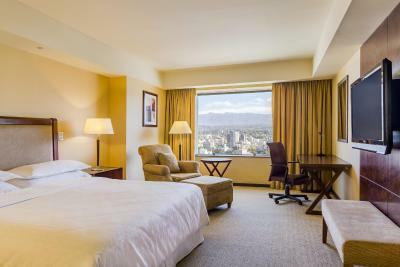 Typical for Sheraton, decor and overall feel is somewhat generic, business-like and charmless but it is hard to argue with predictable high standard. 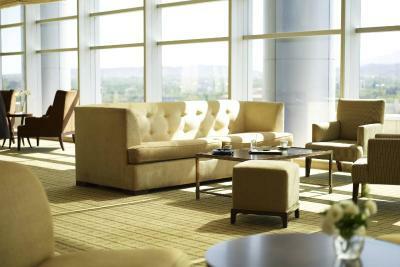 Our club level room was not incredibly large and the rug has seen better times but beds were comfortable and most amenities were present as expected. I would particularly emphasize a high level of care from all young staff members we dealt with. They were all pleasant, helpful, professional, cheerful and fully bilingual. 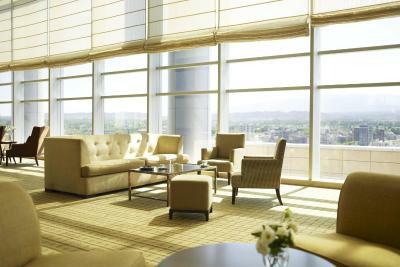 Elegant club lounge on top floor offers great city views and pleasant young staff. Great comfortable room! Very good location as well. Breakfast had amazing view of the city. Friendly, efficient staff. Good location and facilities. Travel agency at the lobby who can arrange excursions for the guests. 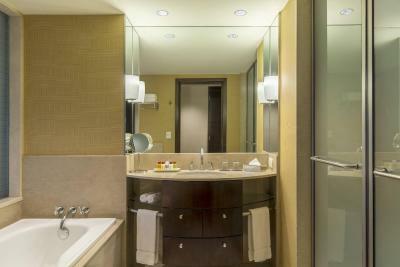 Spacious bed room, spacious bathroom, 24 hours gym, swimming pool, strong wifi. The staff was amazing able to help us with dinner plans to call for help with a minor medical issue. 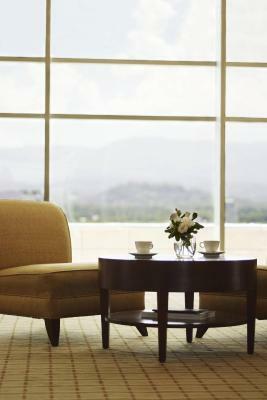 The staff called for a physician or nurse practioner to come to the hotel. I believe it was Franco who helped interpret for me. This was on Monday December 11th about 1130am. The hotel even got the antibiotics for me and delivered to our room. Adjoining rooms were great - spacious. Staff was pleasant. This was my third stay here,and I am coming back again in 2 weeks, wouldnt stay any where else in Mendoza. The staff are excellent, as always. 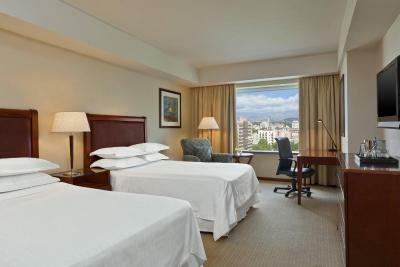 Sheraton Mendoza Hotel This rating is a reflection of how the property compares to the industry standard when it comes to price, facilities and services available. It's based on a self-evaluation by the property. Use this rating to help choose your stay! 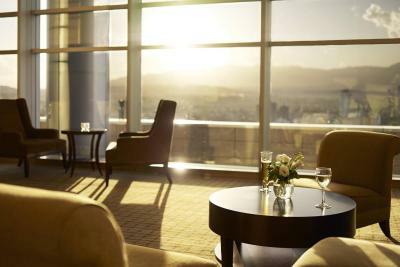 One of our top picks in Mendoza.The new 5-star Sheraton Hotel is steps from San Martin Avenue. 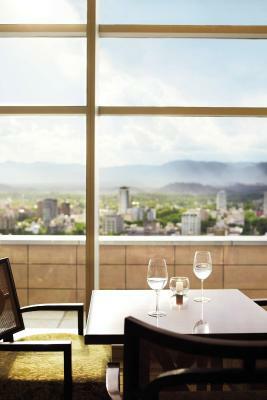 The restaurant offers 360-degree views of central Mendoza and the Andes Mountains. There is an indoor swimming pool, and free WiFi access is provided. 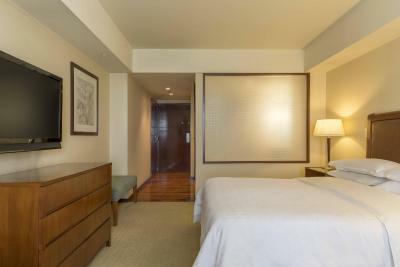 Spacious rooms at the Sheraton are modern and stylish. 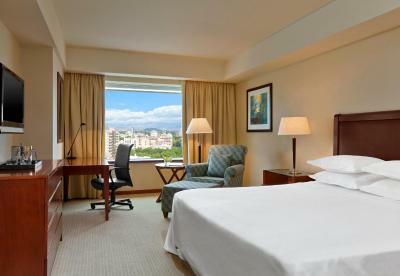 All rooms have a city view, LCD cable TV and a seating area. 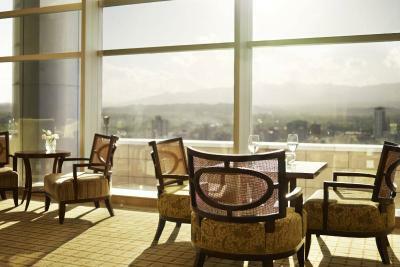 Sheraton Mendoza Hotel features the highest restaurant in Mendoza and serves fine, international cuisine. A daily breakfast is available for an additional cost. 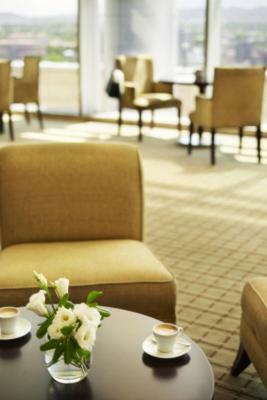 The health club offers relaxing massage treatments, from expert therapists. 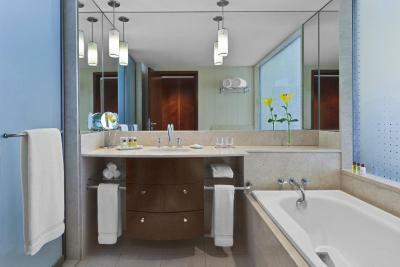 There is also a sauna, hot tub and steam room. 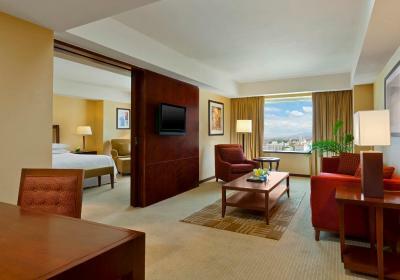 When would you like to stay at Sheraton Mendoza Hotel? 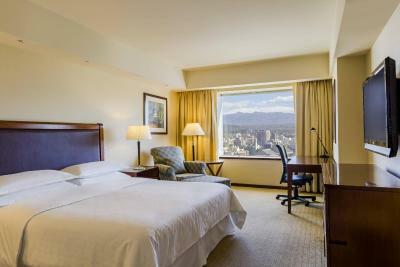 Located in the heart of Mendoza City in the foothills of the Andes, Sheraton Mendoza Hotel is ideally located for exploring one of Argentina's most popular tourist destinations. 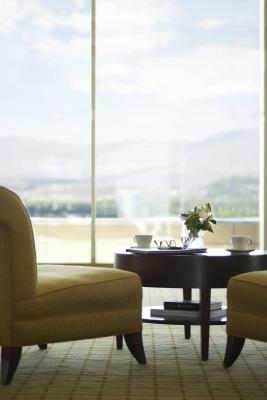 Whether you're interested in quiet pursuits-like sampling the region's famous wines-or more adrenaline-fueled adventures such as skiing, hiking, and mountain climbing, you'll feel at home at the end of each day in our 180 comfortable and guest rooms. 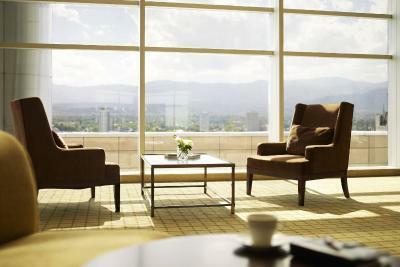 We look forward to welcoming you at the beautiful Sheraton Mendoza Hotel. 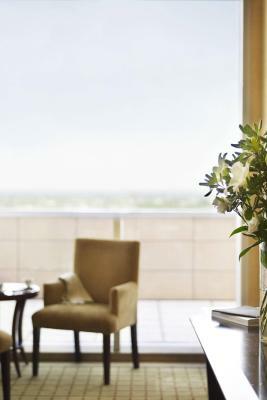 House Rules Sheraton Mendoza Hotel takes special requests – add in the next step! 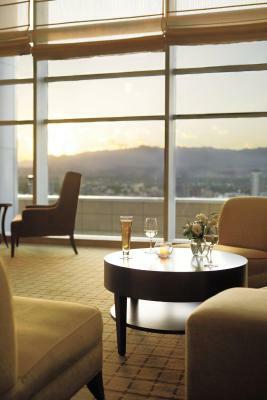 Sheraton Mendoza Hotel accepts these cards and reserves the right to temporarily hold an amount prior to arrival. Pool will be unavailable from the 2nd of April untill the 11th due to renovations. Not far away from the center of city. Very friendly staff. The hotel is ok but getting out of date and doesn’t have the standard of a Sheraton Hotel. No wi-fi in my room on most of my stay. Slow service at the bar-restaurant of lobby level. 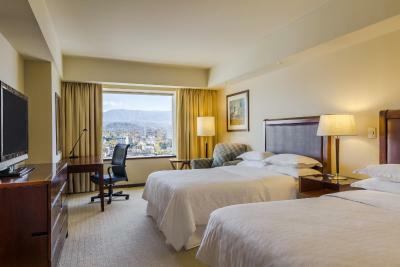 I could not use the shower because I could not regulate the water temperature; There were no coffee making facilities in the room, neither in the lobby excpet in the morning. The were no anglish speaking TV news channels. The breakfast buffet was not up to a 5 stars hotel. There was a serious safety issue, at my floor, both safety exits werte kept open by the cleaning or maintenane staff. I spent my stay closing them, with no effect. This location could be perfect for some, but for me I found it a little far from most of the restaurants and nightlife on the other side of Plaza Independencia. Can't really knock them for it as it is very central but it is worth checking where you'll be spending most of your time. 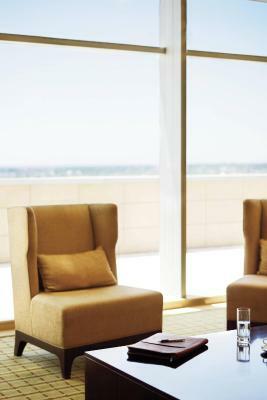 Club lounge enforces zero dress code, even in the evening. Call me old fashioned but admitting young parents in T-shirts with an unhappy, crying infant in diapers is unacceptable in this particular place, especially in the evening. 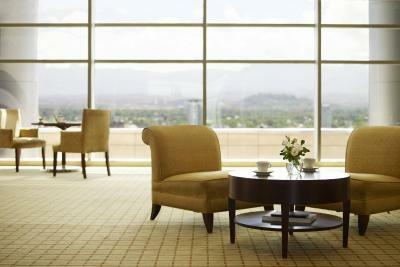 Club lounge is not a general public hotel space. It is for guests who decide to pay extra premium exactly to escape the atmosphere of McDonald’s. No English language news channels on TV. No hot water kettle or coffee maker in the room (although available in the lounge). 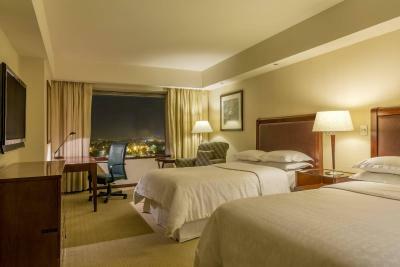 It's what you'd expect from any Sheraton - very comfortable beds and pillows, clean room, nice amenities. This hotel is in a great location too. Everything was perfect and i cannot think of anything i didnt like however the internet speeds can be better but it is good for general browsing but very slow when connecting to my office in London.